Synopsis: Lex Trent is reigning champion of The Games contested between fickle Gods using human playing pieces.He has it all: Fame. Glory. Wealth. An enormous ego.But The Games are about to begin again and the Goddess of Luck wants Lex to defend their title. A challenge he can’t resist, despite the risk of death, because the final round will take place in the Wild West, giving Lex the chance to claim the legendary Sword of Life (who wouldn’t want that?). With Lex’s mix of skill, quick wittedness and no small amount of outright cheating, he can’t lose! Can he?Luck may usually be a lady to Lex...but in the Wild West they play by their own rules...and Lex has never been that good with rules. Lex Trent is renown for his wit, skill, and all-round perfection. At least, he hopes he is. Naturally, he’s lying – not surprising really for a master-cheat and thief. A glamorous thief, really; he doesn’t like to be associated with the amateur thieving community. Lex is just about to start in his second participation of “The Games”, a three-round competition set up by the gods because, well, they’d get bored otherwise. On the menu are daring tasks, fantastical adventures, and world fame. Lex (mortal only, to his displeasure) is only coming for the world fame, naturally. He secretly loves a bit of adventure, but egos like his aren’t easy to keep happy. This time around, he’s coming for the opportunity to steal the Sword of Life, hidden somewhere in a magical old house in the Wild West. With Jesse, his newly aquired cowboy buddy, Lex is looking forward to an easy round of fun and games, with a bit of stealing on the side. I have missed Lex for various reasons. It’s been a year since Lex Trent Versus the Gods was released, and he/it has held a very special place in my heart. Lex Trent Versus the Gods was the first novel I ever received from the publishers, and Alex Bell was the person to instigate my entire ‘career’ in book-blogging. Before I was contacted by Headline to review Lex Trent, I wasn’t remotely aware that publishers even sent books to people like me! But that’s not the only reason I love Lex Trent. I also love him because he is funny, clever and just all around awesome. And that’s why I think you should read this book! It’s odd that sometimes, if you haven’t read a novel from a certain author in a while, it feels awkward to be reading their writing. That’s how I felt when I opened Fighting With Fire: weird. I read chapter one, and felt funny about it. Slowly, by chapter two, I was getting in to it, and by chapter three, I was loving every bit; I was reliving my falling-in-love with Lex Trent Versus The Gods. That isn’t to say this is a perfect book, because it isn’t. As you can imagine, few books I come across are ever perfect. Most of them are just very good. But even without perfection, Fighting With Fire is still awesome, and deserves to be read! That isn’t to say that the fantastical element of the novel wasn’t good, because it was. Alex Bell manages to cover an awesome amount of different sub-fantasy genres. There’s the epic, videogame-type tree-magicky bit. There’s a part that reminds me intrinsically of Alice in Wonderland (a talking fox, anyone? How about tea-for-two?) and, of course, there was just the weirdness of it all: lawyers, Gods, and flying ships. Character-wise, Alex Bell has outdone herself. The newly introduced secondary characters are wonderful, and there’s a wide range, too. Jeremiah is a posh twit who never fails to amuse (here, I think Alex Bell’s British upbringing really shines- us Brits just love to take the mick out of Lords, Ladies, Earls, Dukes and Duchessess! ), and Jesse is a savage cowboy with a strong rivalry with Lex. Both are rich, sumptuous characters who are memorable and ensure that Lex is never left without anything to do. Alex Bell manages to conjure up all manners of wonderful things. 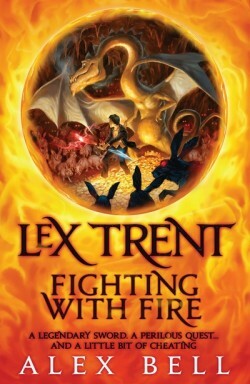 Lex Trent is a fantastic addition to the YA book world, offering comic relief in a genre that is bogged down with too-serious novels. It is well worth reading if you’re looking for a laugh, or just some awesome fantasy. Fighting With Fire is the very definition of compelling.